As you head toward the southeast corner of Oregon a panorama of raw wilderness stretches across the horizon, beckoning solitude seekers. 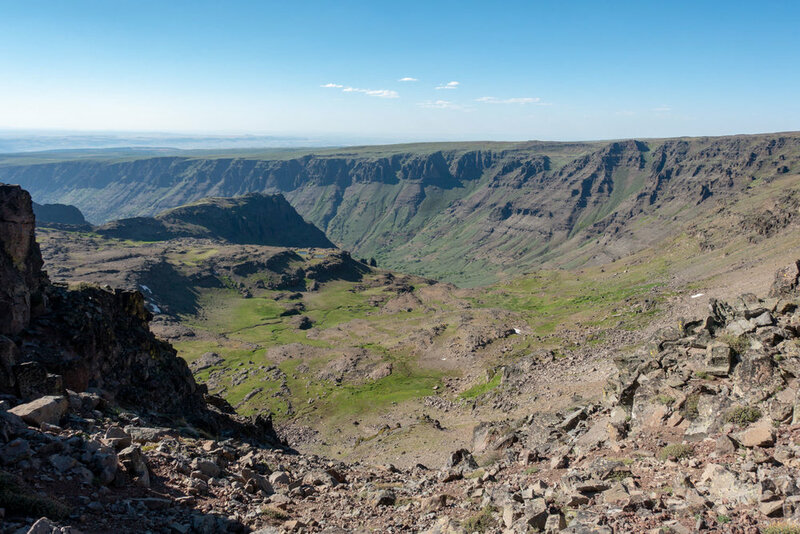 The Steens Mountain monolith runs nearly 60 miles from northeast to southwest and 18 miles across, with its summit sitting at nearly 9,733 feet. What makes the Steens so special and worthy of the long drive are the massive and mesmerizing U-shaped gorges that run almost a half-mile deep on the western side of the Steens. On the east side, you're treated to views of a near vertical 5,500 foot drop to the expansive Alvord Desert, which offers 30 miles of alkaline playa. The Steens Mountain Loop Road traverses the west side of the range for 52 miles through some of the best scenery in the region. It offers views of Fish Lake, The Kiger Gorge, the Steens Mountain Summit, and offers access to highland trails. Hiking options cover the gamut from high desert washes to subalpine meadows to plush green canyons. In this guide, we’ll help you plan your next unforgettable adventure into one of Oregon’s best kept secrets. In general, July through September is the best time to hike the Steens, but in some years you may still be able to safely hike as late as October. During the summer month’s temperatures can reach into the 90’s during the day and drop down into the 50’s at night. While snow conditions vary from year to year, snow usually melts on trail elevations below 7,000 feet by mid-June. At higher elevations, depending on the year, the snow progressively melts, baring ground by the third week in July. Contact the BLM (541-573-4400) before making the trip, especially in late fall or spring, to double-check trail and road conditions. At higher elevations, the weather is susceptible to rapid temperature changes. Blustery, 100-degree days are common and snow can fall year-round. Be prepared for sudden lightning storms, snow, rain, and high winds. Before heading out, check the local forecast for up-to-date conditions. We rate these hike as moderate to difficult. Depending on your itinerary, some of the terrain can be off-trail, very steep and involve difficult scrambles. Also, depending on the time of year and snowpack, some rivers may involve dangerous fords. If you stick to the main trails, the hiking can be gentle and relatively easy. The remote nature of these trails also adds to the rating variance. Cell phone service cannot be relied on for emergency communication. As always, difficulty ratings depend on your experience, physical fitness, pack weight, and weather conditions. Although not a technically demanding hike (unless you’re completing the gorges loop), it requires careful planning for campsites and water resources. Like any backpacking trip, you should plan accordingly, train properly, know your limitations, brush up on your skills, and dial in your gear. Doing so will make for a safe and enjoyable adventure. Also, keep in mind that high clearance or 4x4 vehicles are needed for primitive roads, including the steep and rocky portion of the Steens Mountain Loop Road near South Steens Campground. None required. Fees are applied at organized campgrounds and Pike Creek Trailhead (see information under Pike Creek). 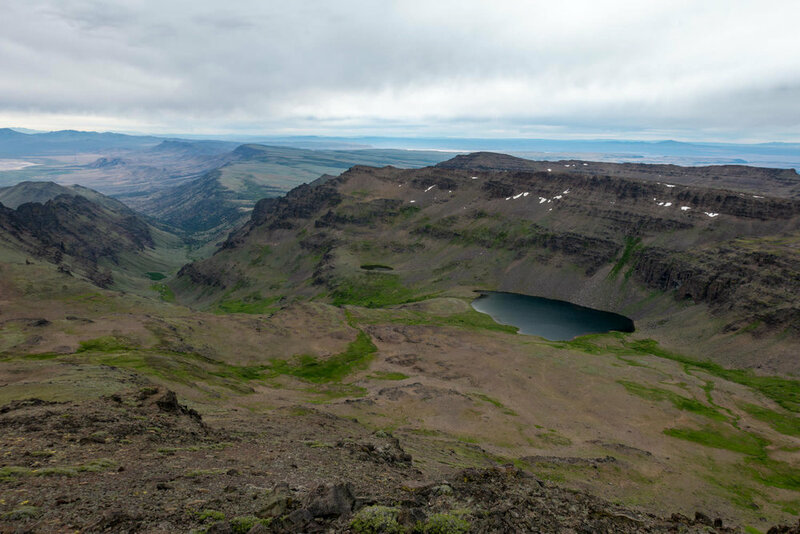 The Steens Mountain Loop Road — the highest road in the state — begins in the hamlet of Frenchglen and runs 52 miles past campsites, lakes and to the 9,733-foot summit. It's an amazingly scenic drive that is a worthy part of any trip to the Steens. 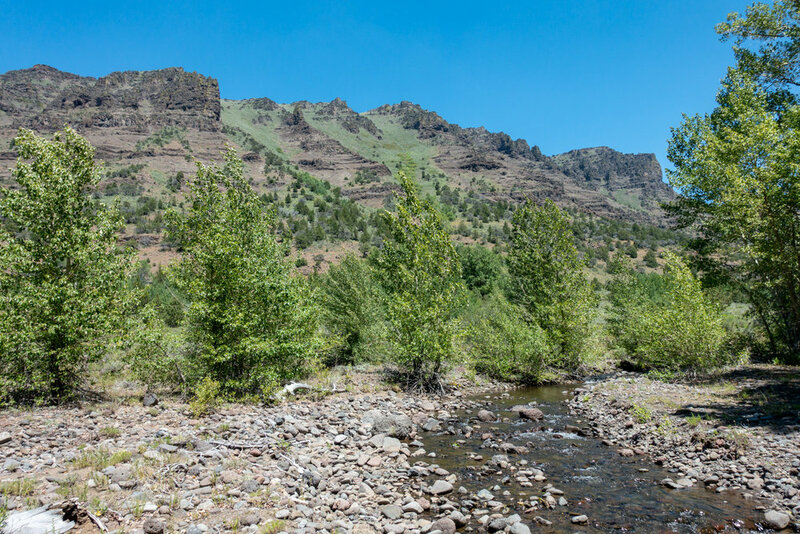 The Steens Mountain Loop Road provides access to four designated campgrounds, Steens Summit and Wildhorse Lake Trailheads, the Riddle Brothers Ranch National Historic District. The views from Kiger Gorge, East Rim, Big Indian Gorge, Wildhorse, and Little Blitzen Gorge overlooks are worth the byway drive. 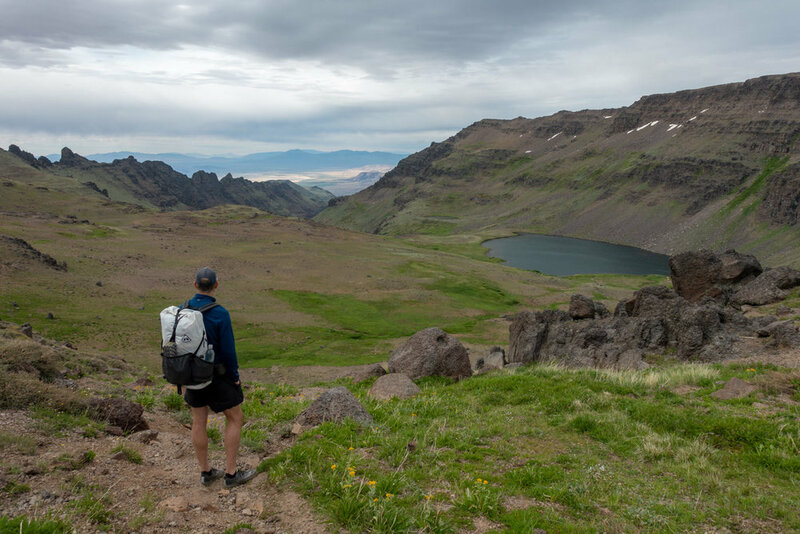 There are many hiking and backpacking options in the Steens, ranging from day hikes to multi-day challenging off-trail adventures. Below we'll highlight a range of the best the Steens has to offer. This is an excellent place to access one of the Steen's iconic gorges. The trailhead leaves from the South Steens Campground. Many complete this trail as a one-night backpacking trip or long day hike. 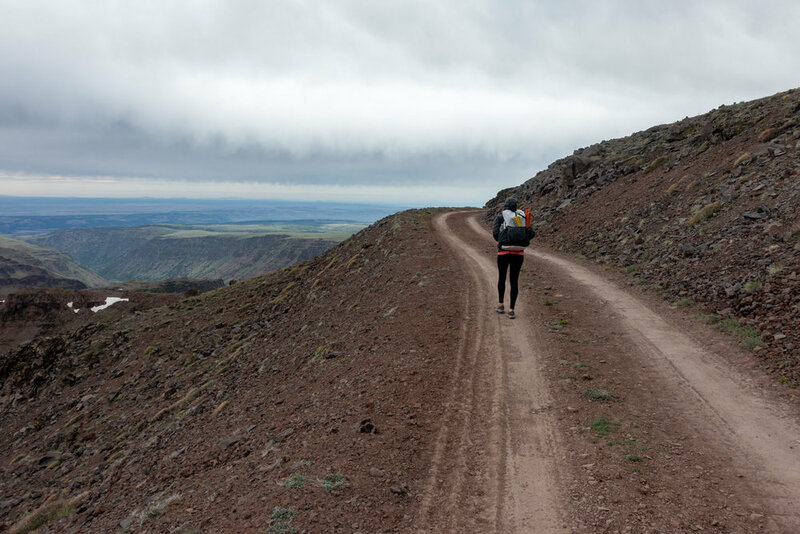 Route: Access the trail from the Steens Mountain Loop Road. About a half-mile descent from the trailhead, you cross the Little Blitzen River, a challenge after a high snowpack year, but also has great swimming holes to enjoy during summer, and continue hiking under 2,000-foot walls along the course of the river. Toward the end near a rimrock knoll, the trail forks. The main trail follows a path to a view of a waterfall cascading in the upper end of the gorge. If you go to the left, you face a steep scramble up to the Steens Mountain Loop Road above,. 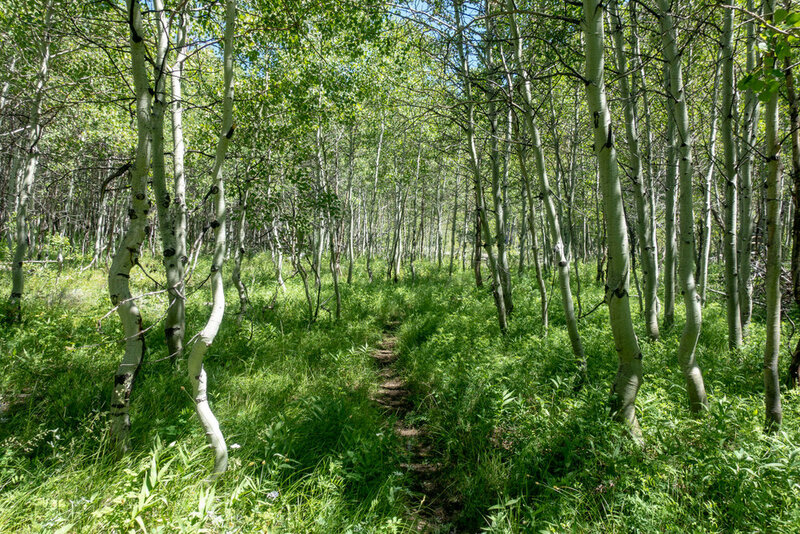 Campsites: 4 miles in, the trail opens up to a plateau and cottonwood grove shading a meadow. Look for campsites in this area. Directions: From Burns, take State Highway 78 southeast for approximately 2 miles. Turn right onto State Highway 205 and travel south for 60 miles toward Frenchglen. Go another 9 miles and turn left on the Steens Mountain Loop Road south entrance. The trailhead is found in the South Steens Campground. Park on the right in the area marked as Little Blitzen Trailhead. The official trail begins just up the road. 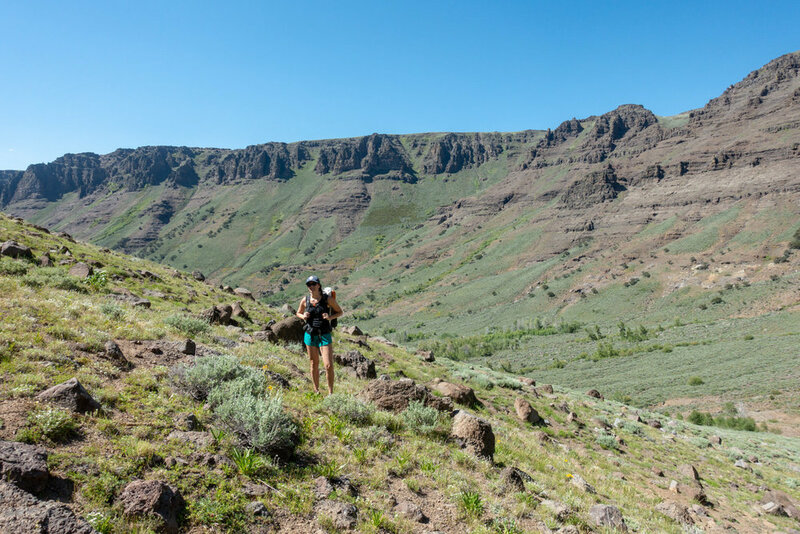 Arguably one of the most fascinating and beautiful of the accessible gorges in the Steens, it also requires trekking along a dirt road for the first couple of miles. Route: Once you get beyond the end of the dirt road, you’ll trek through a riparian zone, meadows and streams (3 crossing, all of which can be dangerous at certain times of the year), before hitting a plateau that butts up against a massive U-shaped gorge pocked with sagebrush, juniper and aspen trees. Campsites: About 6.5 miles (and 6,500 feet) in, you’ll enter a grove of cottonwoods where you’ll find couple of good sites. At 8 miles (turnaround point) the sites are at best uneven. There’s also a big headwall to contend with there. That’s your turnaround point if you're doing an out-and-back. Cradled in the bottom of picturesque wildflower-speckled cirque, this beautiful lake is surrounded by a tapestry of wildflowers, a towering wall on a view overlooking the Alvord Desert, one vertical mile below. Route: The serpentine trail leading to this bowl is located just below Steens Mountain's 9,734-foot summit at the trailhead. From here, you can begin the 1.3 mile and 1,200 foot descent to Wildhorse Lake. Camping is possible at Wildhorse Lake, but we recommend using only designated campsites. 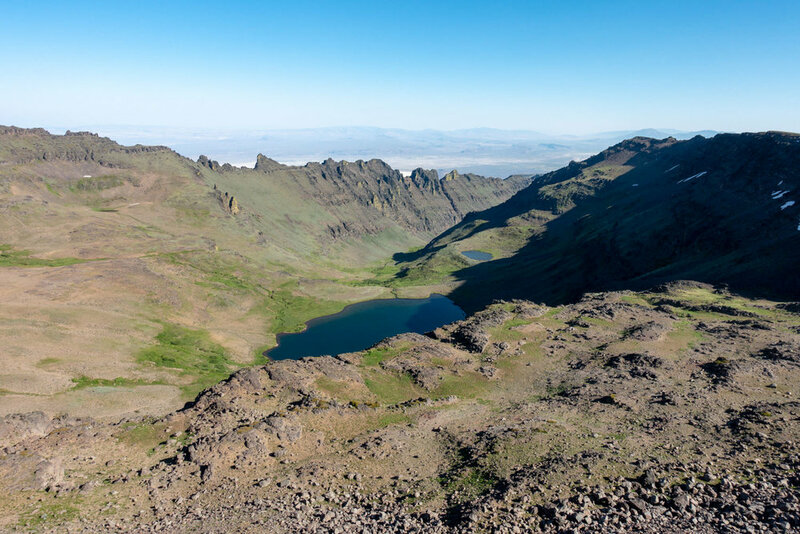 Before or after your trip to Wildhorse Lake, we recommend completing the short and relatively easy 1.5 miles roundtrip hike to the top of Steens Mountain. Although the summit is marked by various towers and other manmade objects, the views over the Alvord Desert are stunning and worthwhile. 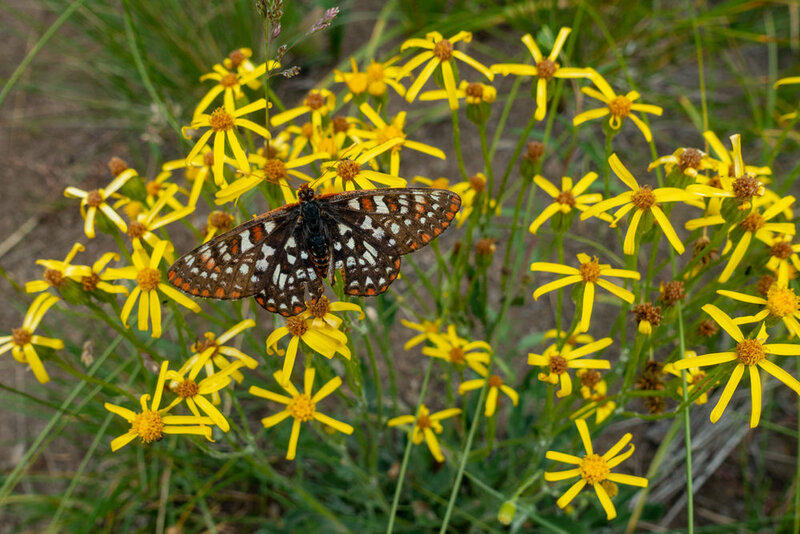 Campsites: There are several campsites near Wildhorse Lake, but please follow Leave No Trace guidelines when choosing a site in this fragile environment. Camp in designated, pre-used sites that are on durable surfaces, such as rock, sand, dry grass, or compacted dirt. Also, you want to make sure that you are 200 feet from water and trails. There is no camping at the Steens Summit. Directions: From Frenchglen, take the Steens Mountain Loop Road and head 22 miles up the mountain to a junction with a sign for Steens Summit/Wildhorse Lake. Go left and follow the primitive road two miles to the road summit parking area. 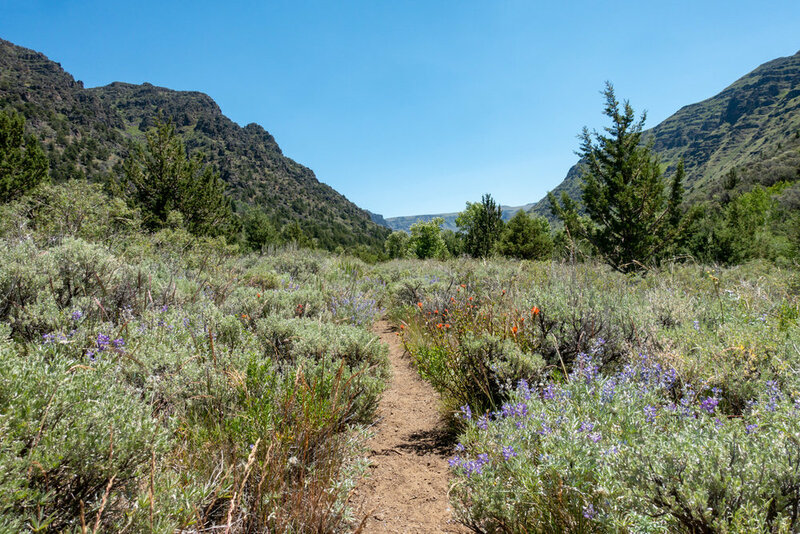 You’ll need to head over to the other side of the Steens to the Alvord Desert to enjoy one of the best hikes in the Steens. Remote, narrow, rocky and steep, it's a fantastic trail and accessible earlier in the season than the other trails due to its elevation. It’s colorful rock outcroppings—pink, red, orange and dark blue— and dark spires dominate a rich riparian corridor. 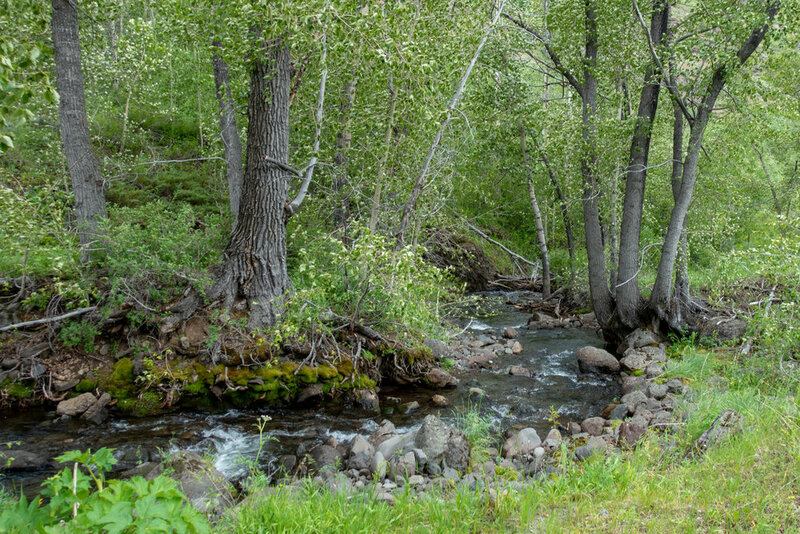 A perennial stream bordered by alder, cottonwood and willow runs through it. The views back toward the Alvord’s alkaline playa are spectacular. Watch for Big Horns! Permit/Fee Required: Before heading out, drive 2.0 miles south on the East Steens Road to the Alvord Hot Springs to purchase a parking and/or camping permit. Since 2016, Alvord Ranch has charged $5 per day to park and $30 per night to camp near the trailhead. Route: Once at the trailhead, you’ll need to bushwhack across the creek to find an old mining road running up the southern bank is required. Follow the single-track trail from here up into the canyon for about 1 mile. You’ll pass a wilderness sign-in box in the first quarter mile. After that it crosses to the left of Pike Creek and enters a “crack” in the mountain. DIrections: From Burns, drive east on Highway 78 for 65 miles past the town of Crane. Turn right at mile marker 65 onto East Steens Road, which has sections of both pavement and gravel, for 38.5 miles to an unmarked road on the right that can be identified by a yellow cattle guard. The road is roughly 3.7 miles past the Alvord Ranch. 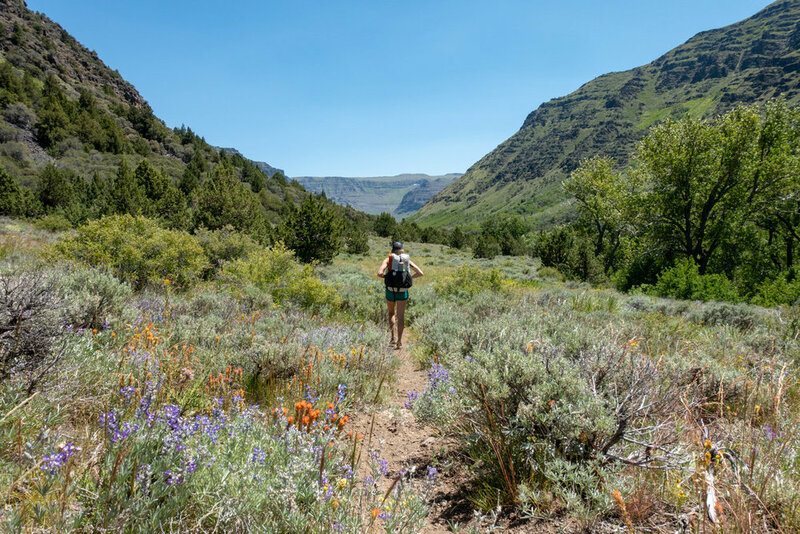 Route: If you want to see the best of what the Steens area has to offer and are up for an experts-only backcountry adventure, then the Gorges Loop may be a good option. The loop "trail" connects the Big Indian and Little Blitzen Gorges, but requires an off-trail ascent and eventual descent of the 2,000 foot headwalls of each gorge. Most of your travel will be improvised and require off-trail navigation. The headwalls are incredibly steep and, at times, require four points of contact to navigate. We do not recommend this trip to unexperienced backpackers as it can be potentially dangerous. If you're completing this loop, we recommend beginning at the Big Indian Trailhead and continuing up the gorge, passing seasonal streams along the way. The trail will begin petering out and will require bushwacking as you make your way to the headwall of the gorge. At this point, you'll want to scout your route up the headwall, exercising extreme caution. 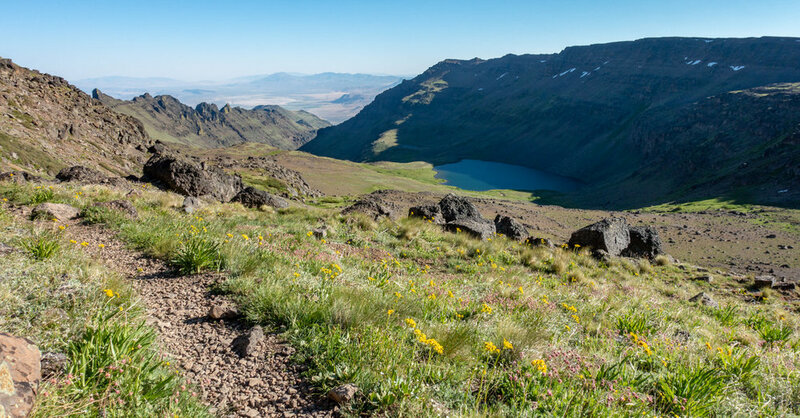 After your make your way up out of the gorge, you'll traverse a high ridge until you reach the Steens Summit Trailhead, which will offer the option to add worthy side trips to Wildhorse Lake and the Steens Summit. After this, you'll follow the Steens Mountain Road for a couple miles until you reach the Little Blitzen Gorge. At this time, you'll begin off-trail navigation again as you scout a scrambling route down into the gorge. After you've made your way safely down into the gorge, you'll eventually meet up with the trail and hike out to the Little Blitzen Trailhead, where your car will be waiting for you. Directions: From Burns, take State Highway 78 southeast for approximately 2 miles. Turn right onto State Highway 205 and travel south for 60 miles toward Frenchglen. Go another 9 miles and turn left on the Steens Mountain Loop Road south entrance. The trailhead is found in the South Steens Campground. Park on the right in the area marked as Little Blitzen Trailhead. The official trail begins just up the road. Google directions here. Campsites in the backcountry are first-come, first-serve. Please follow Leave No Trace guidelines when choosing a site in this fragile environment. Camp in designated, pre-used sites that are on durable surfaces, such as rock, sand, dry grass, or compacted dirt. Also, you want to make sure that you are 200 feet from water and trails. Below is a map provided by the BLM showing organized campgrounds, and the route of the Steens Mountain Loop Road with trailheads. Camping fees are $6 per vehicle, per night, and campsites are available on a first come, first serve basis. US Forest Service Steens High Desert Forest Map - This map is great for navigating the Steens, but doesn’t provide the level of detail off-trail hikers may want. You can buy online or pick one up at the Burns District BLM office. Backpacking Oregon - This book provides a great step-by-step guide to backpacking around the Steens - especially the Steens Mountain Gorges Loop. It also highlights many other fantastic trips around Oregon. 100 Hikes/Travel Guide: Eastern Oregon - This is hands-down the best book on the Steens (although it covers some 90 other trails). The author provides first-person experience along with detailed driving and hiking directions, maps and illustrations. Gaia GPS - We use Gaia GPS on all our backpacking trips to assist with planning our route and on-trail navigation. USGS Topo Map Quad: Wildhorse Lake. Print a free topo map of the Steens Mountain at Topozone. The Steens Mountain Wilderness is part of the 110 million acre National Wilderness Preservation System, designed to provide clean air, water, and habitat critical for rare and endangered plants and animals. 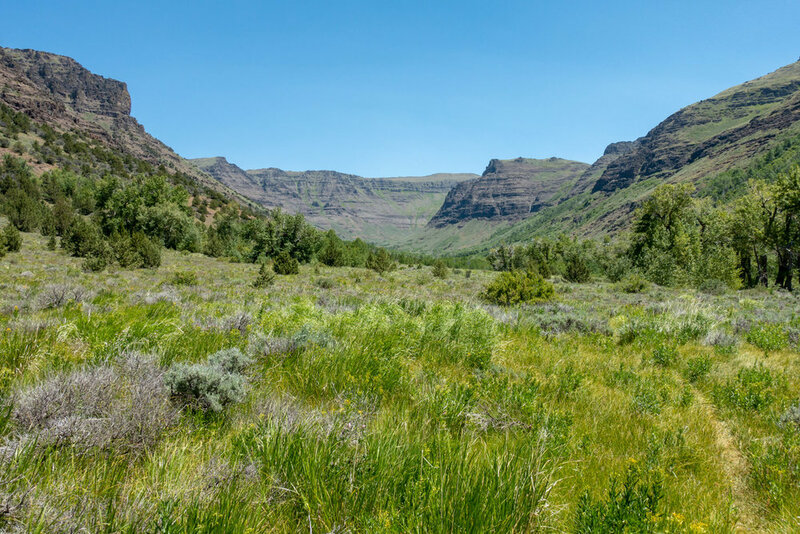 The Steens Mountain Cooperative Management and Protection Area contain a mixture of public and private lands and specially designated areas where special regulations apply. Do not attempt to go around road closure signs and stay on designated open routes; driving off road is prohibited. Respect ranch and landowners in the area and always get permission to go onto private property. Contact Burns District BLM for more information. Limited water sources require carrying enough water to last your entire trip in certain areas at certain times. Check with BLM before you head out as conditions and water availability is often weather dependent. Some trails have streams or lakes you can collect water from, but by midsummer others have dried up. Avoid drinking unfiltered/unpurified water from untested sources in the Steens. Filtering of all streams, rivers, seeps and lakes is necessary. Carry a good water filter or purifier. We carried the SteriPEN Ultra and we were happy with its performance. Check out our best water purifiers’ list for our top recommendations. There are no specific food storage requirements in the Steens. That said, you should always protect your food against rodents and small critters, which will tear through your backpack or tent without hesitation. We recommend packaging all your food and scented products in a food storage container such as an Ursack. Mosquitoes are present along this route in early summer but level off later in the season as sitting water dissipates. Hiking later in the season is often bug-free. Use a combination of permethrin on your clothing and bring a small bottle of DEET or Picaridin for exposed skin to provide full protection. 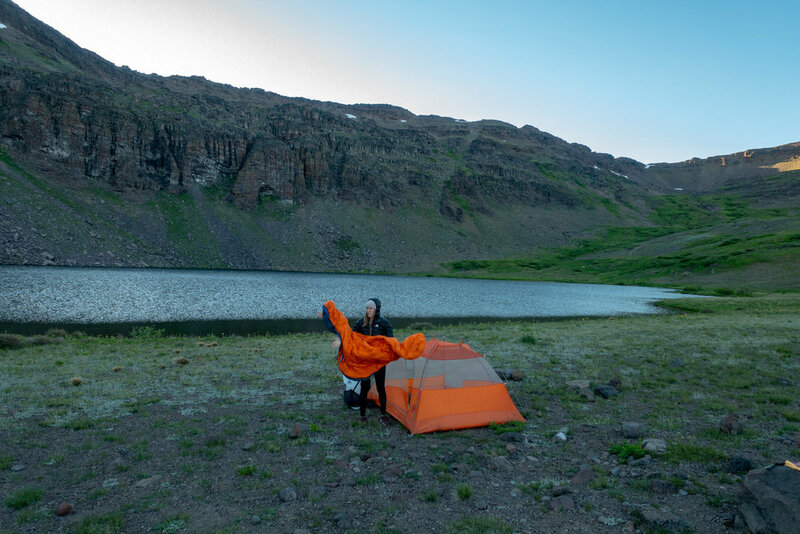 TENT: We used Copper Spur HV UL3 tent for this trip for its lightweight livability. The Copper Spur series tents are our top pick on our best lightweight backpacking tents list. 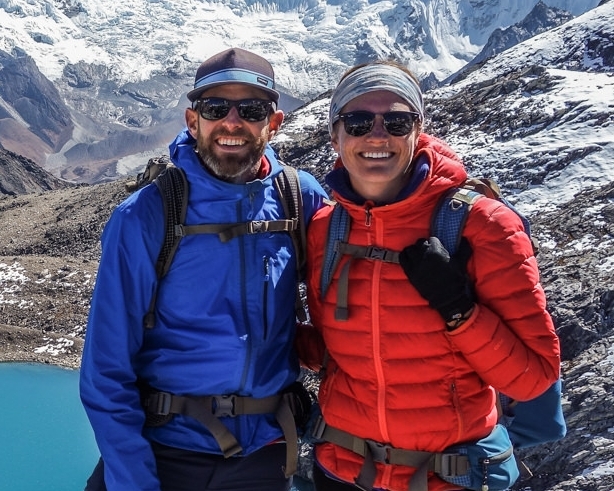 BACKPACK: We both used Hyperlite Mountain Gear’s 2400 Southwest backpacks on this trip. They’re lightweight, comfortable, nearly waterproof and make our list of the best lightweight backpacking packs. SLEEPING BAG: We used the Feathered Friends Egret UL 20 sleeping bag and the Enlightened Equipment Revelation quilt on this trek for night time temperatures around freezing. Both sleeping systems are lightweight, warm, and make our list of the best backpacking sleeping bags. SLEEPING PAD: We used the Therm-a-Rest NeoAir XLite and Sea to Summit UltraLight Insulated sleeping pads on this trip. Both are light, comfortable, warm, and make our list of the best backpacking sleeping pads. COOKING SYSTEM: We used the BRS Stove, Snow Peak Mini Solo Cookset, and Snow Peak Folding Spoon on this trek, all of which make our top picks gear list and best lightweight stoves list. WATER PURIFIER: We used the SteriPEN Ultra as our main purification method on this trip. It's lightweight, works fast, and doesn't require any pumping/squeezing or chemicals. Check out our best water purifiers list for our other top recommendations. SHOES OR BOOTS: We wore Saucony Peregrine 7 trail runners (men's and women's) on this trail and they were excellent. If you prefer boots, make sure they’re lightweight and break them in really well before your trip. Here’s why we prefer hiking in trail running shoes: 5 Reasons to Ditch Your Hiking Boots. Also, here's our top picks for the best backpacking footwear. PERSONAL LOCATOR BEACON OR SATELLITE MESSENGER - Hiking in the Steens is remote with very limited cell reception. We recommend taking along a PLB or Satellite Messenger device that will allow you to signal for help if an emergency arises. It could be a matter of life or death. FOOD: You'll have to carry all the food you'll need on this trip. Check out our Best Lightweight Backpacking Food Guide and our Best Freeze Dried Backpacking Meals for some of our go-to recommendations. Also, we recommend storing your food in a critter-proof container, such as an Ursack. MAP & COMPASS: You always want to hike with a good map and GPS system, such as Gaia GPS. We used the US Forest Service Steens High Desert Forest Map, but used both GPS and our map to ensure safe navigation. In addition, we always hike with a compass. SUN PROTECTION: Sunglasses (polarized recommended), sunscreen, and spf lip balm are an absolute must for every backpacking trip. SMALL TOWEL: the Nano pack towel is great. INSECT REPELLANT: Use a combination of permethrin on your clothing and bring a 1oz bottle of DEET or Picaridin for exposed skin to provide full protection. We hope this guide helps you plan a fantastic backpacking trip out to the majestic Steens Mountain in Oregon. As always, please leave a comment below if you have any recommendations, questions, or suggestions. And if you found this guide helpful, click the little like button below to give us a digital high five!